New 2019 SPD Cleat Wedges improve alignment and solve common pain issues for most cyclists. Now formulated with a stronger and durable compound, these SPD wedges were made to prevail in the harshest conditions on the road, trail or mountain! 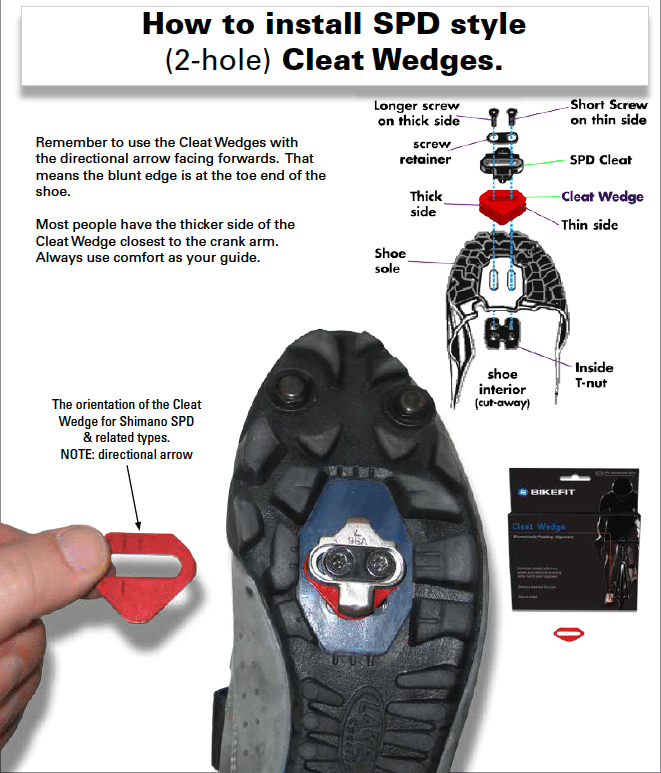 Stop pain now with cleat wedges! MTB/ SPD Cleat Wedges® work with SPD-compatible cleats and most other side-by-side two hole cleat systems. 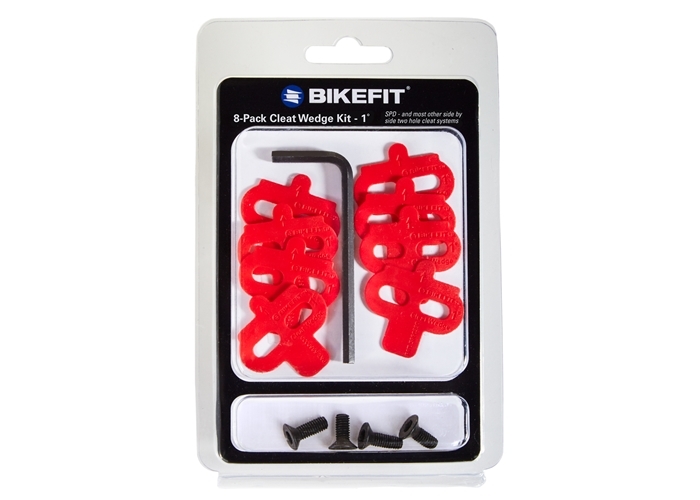 BikeFit specifically uses hex bolts for all SPD-style 2-hold cleat applications to provide the most secure connection. The box includes eight (8) 2-hole SPD Cleat Wedges, two (2) 12 mm & two (2) 14 mm hex screws, an Allen key wrench, and installation instructions (also downloadable below). Solves problems with alignment and common cycling pain (foot, knee, and back). Durable plastic to battle the conditions of dirt and road. Flexible enough to conform to the stiff sole of a rounded cycling shoe. New formula increases the strength of the plastic. The 2-hole system is commonly known as the SPD system (SPD = Shimano ® Pedaling Dynamics). The 2-hole system can be used for all types of riding, including road cycling, mountain biking, touring and commuting. When paired with some shoes, the recessed cleat design allows easier walking. 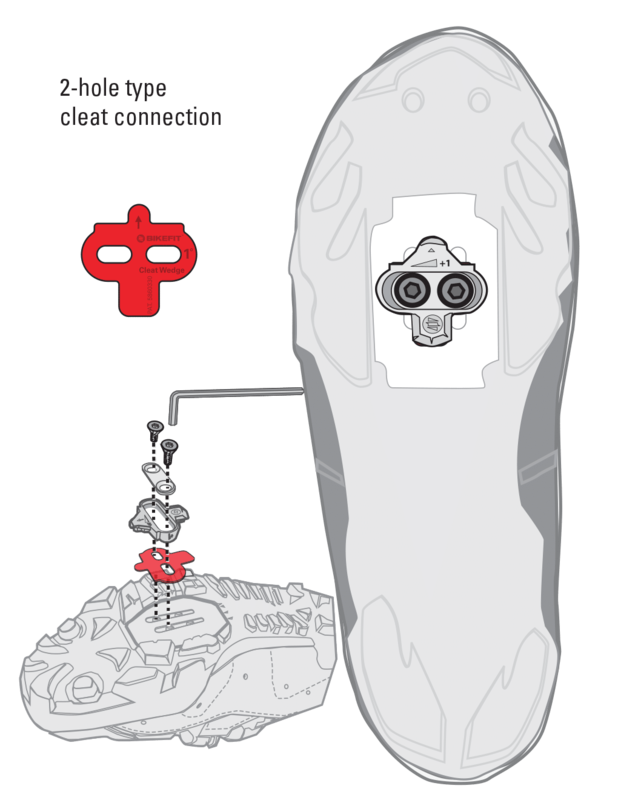 Most off-road racing, where a mud-shedding cleat design offers an advantage, is where a small two-hole cleat is popular.